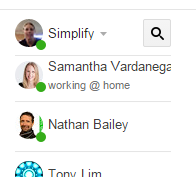 The Hangouts chat list in Gmail displays your contacts in alphabetical order. This means that if your favourite chat buddy is called Zane Smith, he might get lost at the bottom. 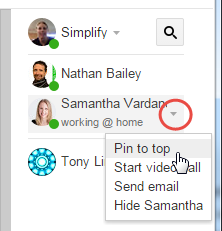 A relatively new feature solves this dilemma by allowing you to ‘pin’ specific contacts at the top of the chat list. It’s simple to do, just follow the instructions below. 1. Hover over the name of the person you want to pin until you see a little arrow appear on the right. 3. Select Pin to top. 4. The contact will now always be displayed at the top of the chat list.